Dr. P.A.Kareem is a famous Naturopathy doctor from India visiting Kuwait. He will deliver a lecture about his successful treatment methods based on Naturopathy at Indian Embassy Auditorium, Kuwait today, 6 November 2014, at 5.00 p.m. This event is organized by 'The Valaikuda Vanambadi Poets Association'. An interactive question and answer session will be conducted by Dr. Kareem, to clarify doubts regarding the Naturopathy / Nature cure. 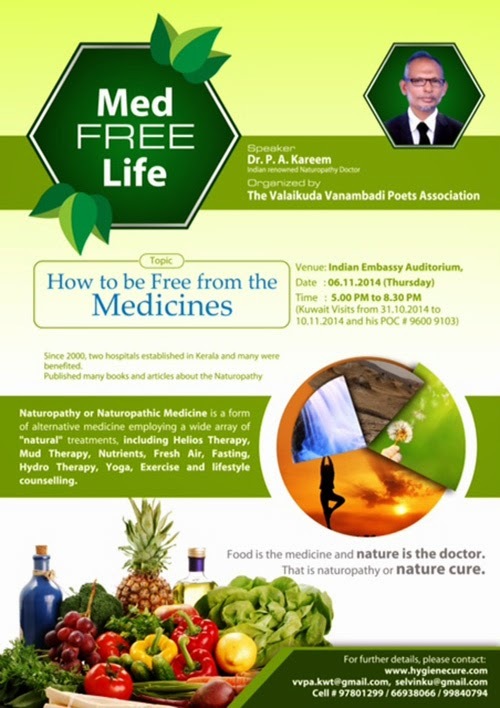 All are invited to utilize this free and rare opportunity to maintain your health through Naturopathy or Nature cure. Naturopathy is a form of alternative medicine employing a wide array of "Natural" treatments, including herbalism, and yoga, as well as diet and lifestyle counselling. Naturopaths favour a holistic approach with non-invasive treatment and generally avoid the use of surgery and drugs. Naturopathic philosophy is based on a belief in vitalism and self-healing - body's ability to heal itself through a special vital energy or force guiding bodily processes internally. Dr. Kareem is successfully running two Naturopathy hospitals in Kerala, rendering excellent health service. He has authored several books on Naturopathy in various languages. Dr. Kareem sensitizes the people how to live free from medicines. New Diet Taps into Innovative Plan to Help Dieters Get Rid Of 23 Pounds within Only 21 Days!